A Mike Singletary personal appearance, Mike Singletary speaking engagement, or Mike Singletary endorsement will reflect well on your company. To hire Mike Singletary now for any corporate appearance, fundraiser, motivational speaker event, personal appearance, autograph signing, or website endorsement please contact our celebrity agents at 1-877-6-SPORTS. We will contact Mike Singletary or contact Mike Singletary's agent and provide you with the booking fees and availability immediately upon your request. Direct Sportslink is the only sports speakers bureau and talent booking agency based in the United States securing only sports talent for corporations, associations, and organizations for motivational speaking engagements, personal appearances, and endorsements. We are the premier sports celebrity booking agency and a sports celebrity procurement expert. Accordingly, we will provide you with any relevant Mike Singletary website information and booking agent details so that you can hire Mike Singletary for your next event. While with the Bears, Singletary was known as "The Heart of the Defense" for the Monsters of the Midway in the mid-1980s. "Samurai Mike" was also nicknamed "The Minister of Defense" since he was ordained a minister during his career with the Bears. An intense player, Mike finished as the Bears' first or second leading tackler each of his last 11 seasons. He amassed an impressive 1,488 career tackles, 885 of which were solo efforts. A constant force on defense, he missed playing just two games, both in 1986. Singletary was named NFL Defensive Player of the Year by the Associated Press in 1985 and 1988. 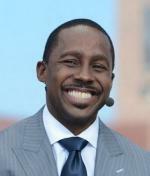 He was elected to the College Football Hall of Fame in 1995 and to the Pro Football Hall of Fame in 1998. In 1999, he was ranked number 56 on The Sporting News' list of the 100 Greatest Football Players. Selected to play in a team record 10 Pro Bowls, Singletary was All-Pro eight times, and All-NFC every year from 1983 to 1991. In 2003, Singletary became linebackers coach for the Baltimore Ravens. Following the 2004 season, the San Francisco 49ers hired Ravens defensive coordinator Mike Nolan to be their head coach, and Singletary left the Ravens with Nolan to be San Francisco's assistant head coach and linebackers coach. In 2011, Singletary joined the Minnesota Vikings as a linebackers and assistant head coach. In addition to his coaching duties for the 49ers, Singletary is a motivational speaker and has authored three books; Singletary One on One, Calling the Shots, and Daddy's Home at Last. 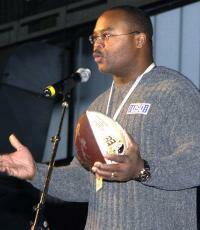 Based on your interest in Mike Singletary as a speaker or for a personal appearance, Direct Sportslink has provided you additional links below for other sports talent with similar appearance fees, speaker topics, and categories that match Mike Singletary.